Reduce building energy use by 2 percent annually to achieve 30 percent reduction from 2005 baseline by 2030. 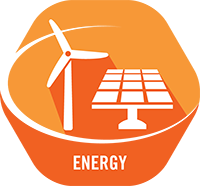 The purpose of the Energy badge is to encourage practical, best management practices and actions to reduce energy consumption appropriate for individual businesses and industries. Commercial buildings and industrial processes consume 38 percent of the total energy used in Fort Collins. Achieving this business goal will be critical to meet our Climate Action Plan targets.